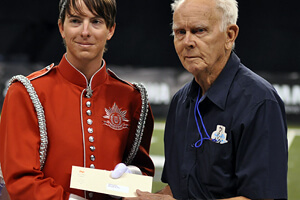 Scholarship at the 2012 DCI World Championships. Two organizations, the 27th Lancers Foundation and Sponsors of Musical Enrichment, Inc. (S.O.M.E. 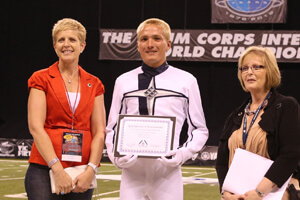 ), welcome scholarship applications from drum corps members, and plan to announce their 2013 recipients at the DCI World Championships in Indianapolis. The 27th Lancers Foundation, dedicated to supporting young people who seek to further their education and awareness of the performing arts, grants two scholarships each year: one to a person actively involved in the performing arts, and one to a person pursuing a career in education. The scholarship fund remembers 27th Lancers founders Patsy and George Bonfiglio, advocates of young people who hold an appreciation for performing arts and pursing ambitions. Applicants must submit letters of recommendation, transcripts, and an application with information regarding academics, extracurricular activities and future plans by July 1. Learn more about the George and Patsy Bonfiglio Scholarship. 2012 Ott Scholarship recipient Kevin Hoenie of Music City. S.O.M.E., a non-profit supporting music and performing arts organizations, presents the Jim Ott Scholarship each year. The award honors the memory of the late DCI Hall of Fame member who is known for his brass arranging and instructional work in the 1970s with drum corps including the Blue Devils, Spirit of Atlanta and the Stockton Commodores. The Jim Ott Scholarship requires applicants to be pursuing a degree in music and demonstrate financial need and leadership qualities. S.O.M.E. must receive application materials, including letters of recommendation and transcripts, by July 15. Learn more about the Jim Ott Scholarship.